Left to Right: Joseph Bideganeta, Elizabeth Bearden, Elisa Agner, Katie Corder, Adrie Blanksma, Emily Cruser and advisor Kya Vines. 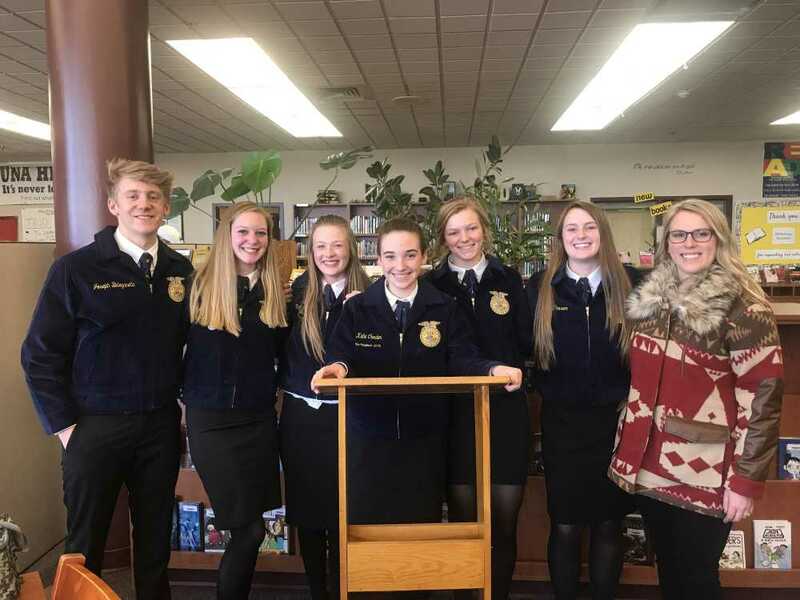 On March 13, the Mountain Home FFA Chapter traveled to Kuna High School to compete in the state qualifying parliamentary procedure competition. Students participating in the Parliamentary Procedure Leadership Development Event (LDE) are evaluated on their ability to conduct an orderly and efficient meeting using parliamentary procedure. Participants are judged on their knowledge of parliamentary law and their ability to present logical, realistic and convincing debate and motions. This team consisted of Katie Corder (Chairmen) Elizabeth Bearden, Adrie Blanksma, Joseph Bideganeta, Elisa Agner, and Emily Cruser. The team placed 4th overall. Katie Corder took 3rd place as the Meeting Chairmen. Elizabeth Bearden and Kamryn Orr went through an interview process for the 2019-2020 Boise Valley District FFA Officers. The BVD officers have the responsibilities of making sure the district competitions run smoothly. Elizabeth Bearden was elected as the 2019-2020 Boise Valley District FFA Reporter. The Mountain Home FFA is so proud of Elizabeth Bearden for this accomplishment.